Hyperopia or farsightedness is a condition where the eyes see better at distance than near. If the person is farsighted enough they will also need glasses for distance as well. 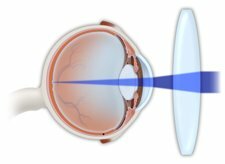 Many people think that being farsighted means they have normal vision at distance but farsighted people need plus lenses to see clearly at distance. Emmetropia is the medical term for someone who sees clearly at distance without glasses not hyperopia. Typically many people with hyperopia do not need glasses for distance until they reach their forties. They are able to focus smaller amounts of hyperopia without glasses. In our forties, the lens inside the eye starts to lose its ability to focus and people begin to become more farsighted and need glasses. Usually this becomes stable around age sixty. The problem with treating hyperopia is that the severity of the hyperopia becomes worse over time until we reach the sixties. Whatever treatment is done earlier may not last due to this change. Many doctors would choose not to operate on someone who is hyperopic until they reach their sixties and do not have any evidence of cataracts. Conductive keratoplasty is a procedure designed to correct hyperopia. The surgery involves using a radiofrequency device that changes the shape of the cornea without cutting it. 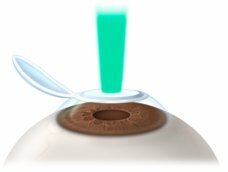 The treatment is applied to the mid-cornea area and the cornea is made steeper by the device shrinking the collagen in the cornea. The treatment tends to lose some of its affect over time as well as the eye becoming more farsighted with time naturally. It is able to treat smaller amounts of hyperopia and the good aspect is that it can be repeated. LASIK and PRK use an excimer laser to cut and remove tissue from the cornea. The computer that runs the laser shapes the cornea in a manner that corrects the hyperopia. The problem with laser treatment is that as the eye becomes hyperopic again, it involves much more risk when trying to repeat the procedure. This treatment is better for someone who is approaching their sixties and their eye glass prescription is not changing. Phakic intraocular lenses are placed inside the eye while leaving the natural lens in place. There are two types of these lenses called Verisyse and Visian. 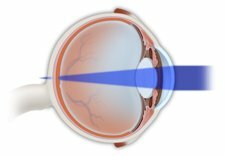 The Verisyse is attached to the iris inside the eye and the Visian lens is placed behind the iris in front of the natural lens. This is usually reserved for patients with large refractive errors. The is surgery where the normal natural lens without a cataract is removed and an intraocular lens is placed inside the eye just like with regular cataract surgery. This is also usually reserved for larger refractive errors. There are several options for surgically correcting hyperopia. You should use care when deciding on surgery and the type of surgery as the hyperopia progresses from the forties to our sixties.